ARRA News Service: The Inauguration & The Trashing Washington D.C. 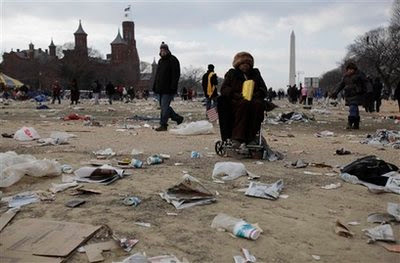 The Inauguration & The Trashing Washington D.C.
A picture is worth a "million" words; after their victory bash,consider how the eco-conscious "progressives" left Washington, D.C. There were 2.7 million people at the inauguration in Washington D.C.
18 of them missed work. For those insulted that "progressives" could not pick-up their own trash, you are a "Real American." If you are insulted by Texas Fred's joke, after viewing the photo, --- study the photo again. Then if you are more bothered by the joke than the reality presented by the photo, send your comments and we will let other readers educate you. Tags: TexasFred, presidential inauguration, Washington D.C., Washington Monument To share or post to your site, click on "Post Link". Please mention / link to the ARRA News Service. Thanks! I am the ghost of Nathan Bedford Forrest incarnate in their opinion, I don't like Obama, I have a very bad opinion of the DNC and it's participants so thus it follows, I am a racist!! It's enough to make me weep. Environmentalism isn't about the environment - it's about power and feeling good about yourself. What did it look like after Bush's inauguration? Why are you reading so much into this picture? Every major city looks like that after any outdoor event that large amounts of people attend (not to mention arena, concert venue). Trust me I have been involved with Public Works for years and it is planned before any parade, outdoor concert or rally that there is going to be clean up. I guarantee you the mall was clean by the next morning at the latest. I realize you do not like Obama or the people that follow him, but save your complaining about something real. In response to Chandra's comment, who identifies that bad behavior exits with the crowds at all events, first, it is not true and second, it is no excuse. I have been to rallies at the Capital where the people left absolutely no trash behind. Your comment also makes a false presumption when it states: "I realize you do not like Obama or the people that follow him . . ." Nothing was said against President Obama in this post. Also, a few of my friends and my family members supported Obama. In fact, I advocate praying for our new president. However, as a free citizen, I have the right to not support programs and actions that do not support traditional values or that move our country toward socialism. And as for your words "follow him" what do these mean. We don't have a King or a Rock Star for President which are to be "followed." Just like the presidents before him, President Obama is not a potentate or dictator. He is a fellow citizen who was picked by the majority of the electoral college to be President of the United States. Consider the example, in the oath of office for Military Officers, it does not say they will "follow" the President. 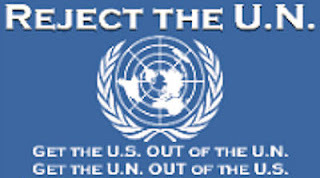 It says they "will preserve and defend the Constitution of the United States against ALL enemies foreign and domestic." We are all equal citizens in the United States. However, some of our equal fellow citizens choose to act badly on this very "special" day in history. They choose to not to pick up their trash. Readers (regardless of party) who were "insulted" by such bad behavior in the photo are "Real American" because they care about their country and places that represent us to the world. This reminds me of an Earth Day rally on the Capitol Mall; they left the grounds (our Earth) trashed. The next large group which was three times the size was the a March for Life rally. They picked up completely after themselves. What a contrast even the National Park Service noted the difference. Not all people at the Inauguration disrespected public property, but as evidenced by the photo, a significantly number did "trash" the mall. And having people paid to clean-up is not excuse; bad behavior results in wasted taxpayers money. People should clean up after themselves! Finally, thank you to the Park Service and contractors who cleaned up this mess. You are appreciated! Looks like one of the federal housing projects on the south side of Chicago.